Dean promised to slay monsters for me. Not once has he broken that promise. Not once has he retreated from battle. Not once has he failed to keep me safe. But now, as our marriage is complete with two beautiful children and a blissful home life, we're attacked by a monster that my husband can't destroy. A monster he can't even face. As Dean and I struggle to stand together, we're forced to confront our deepest fear. Not even our intense, precious love can protect us from all evil. 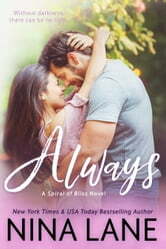 The love story of Liv and Dean West, and their beloved friends and family in Mirror Lake, that started with AROUSE and continued in ALLURE, AWAKEN, ARRIVE, BREAK THE SKY, and ADORE now comes to a breathtaking conclusion as the professor and his beauty fight the battle of their lives. Breathtakingly beautiful. Gut wrenching. Joyful. Nina Lane has allowed us to be part of Liv and Dean’s lives as if we are their neighbors. Always - made me laugh, made me cry, all while I felt and believed in the depth of their love. Liv’s fight is one so many readers can relate to whether from personal experience or by having a family member that went through a similar journey. I was awestruck at how well Nina Lane let us into their innermost thoughts while they traveled this emotional and treacherous road. I loved experiencing how this impacted both of them in very different ways but at the core, they focused on their love for each other to get them through. Nicholas and Bella are beautiful lights in their world and are a joy. Oh Archer and Kelsey, what a fabulous duo. Dean and Archer come a long way in this book as they rebuild their relationship and Dean truly ‘sees’ Archer for the first time. To me, Dean really learns this most in this installment as he faces the reality that he can’t fix everything for the love of his life which is a very hard thing for him to accept. This is truly an epic journey. I have enjoyed this series since book one and the conclusion is just as real and romantic.